Generic Company Place Holder Zombies!!! The dead are a problem. Whether they are the walking or evil varieties, their predilection for eating flesh is proving to be a problem for those who prefer to keep their organs intact. That’s the basis for Zombies!! !, a new game of post-apocalyptic survival from Babaroga. It’s based on a popular board game from Twilight Creations in which players compete to escape from a town infested with brain-biters. You can help or hinder your fellow players with Event cards. In this Windows 8 version, up to four players vie to be the first to reach a heliport, where there is one empty seat on the last flight out of zombietown (population: lots, and they are all hungry for brains). Alternatively, you can win by double-tapping 25 zombies. While searching for the heliport, you can explore locations such as hardware stores and houses to find useful things, such as chainsaws or bullets, but there are also zombies waiting for you in there. You can also use event cards to slow other players (such as the claustrophobia card, which makes them run out of buildings) or speed your own journey (such as the alternate food source card, where the zombies find something else to eat and don’t bother you). In each turn, you also get to move some of the zombies, so you can point them in the direction of a tasty snack, such as another player. As you progress through the map, it becomes a tactical game: Do you use your cards to speed yourself, or block other users? Does it make sense to move the zombies out of your way, or direct them to your competitors? There is also a survival mode, which drops you into zombieville to see how long you can last. Combat is based on the role of a dice, modified by the cards in play. The graphics are very cartoony, which makes the gun and chainsaw-related violence a little more abstract than in most zombie TV shows. The game ran smoothly on the low-end tablet that I tried it on, so it should run well on most systems, and the sound and graphics added well to the atmosphere. Because it is based on a card game, Zombies!!! 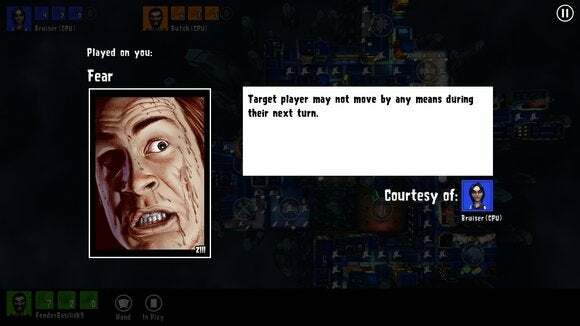 uses a turn-based approach and favors strategy. The combat is based on the roll of a dice and the cards in play, not the speed of your reactions. This means that those looking for a gore-filled twitch fest will be disappointed, but those who like to think before they tap will appreciate the strategic and competitive angle of the game. Darn, dead again. Fortunately, being eaten just puts you back at the starting point with a reduced score. Zombies!!! is an amusing (if blood-soaked) game, and the computer version retains much of the charm of the card game, while enhancing it with cartoonish sound effects and visuals. The game carries a teen rating, and that’s appropriate: Although the violence is strictly for comic effect, younger children might find some of the death scenes a little unsettling. But, as the old saying goes, the family that slays together, stays together, and Zombies!!! could be a cute, creepy addition to a game night. Note: The Download button takes you to the Windows 8 store, where you can download the latest version of the software. Based on a board game, Zombies!!! is fun enough to distract you from chewing on brains.